Laser therapy is an innovative technology used to treat acute and chronic injuries. The non-invasive treatment stimulates cell regeneration by increasing blood flow to the targeted area. At Animal Hospital of Sandy Springs, we utilize a K-laser, a class-IV laser that uses specific wavelengths of light to stimulate the body’s natural ability to heal. We can treat many other conditions, ailments and illnesses with K-laser therapy as well. Talk to your veterinarian about your pet’s options. 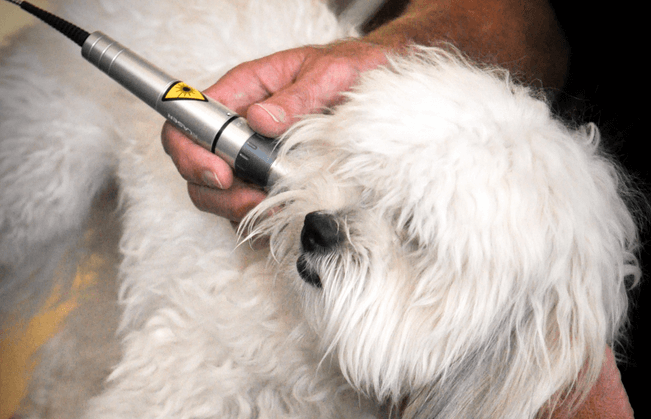 Typically, we combine laser therapy treatments with other types of veterinary medicine, including pharmaceutical regimens and alternative therapies. If you would like to know more about K-laser therapy and how it can benefit your pet, please contact Animal Hospital of Sandy Springs.